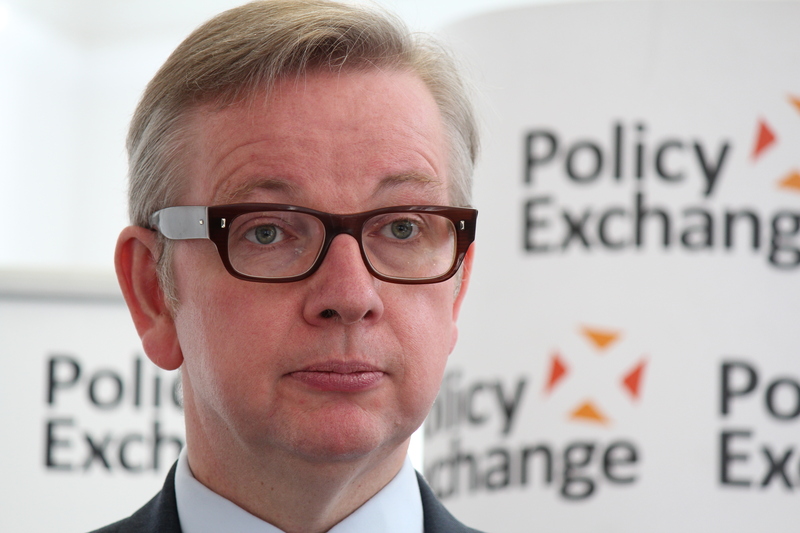 ← General Election Reshuffle sends Gove to Defra. Last week I wrote about Michael Gove’s surprise arrival as Secretary of State for the Environment Food and Rural Affairs. There is so much more to write about this, but time is limited and I will not be able to cover everything in one piece. Gove obviously has achieved notoriety amongst the Education establishment, by driving through unpopular reforms to the National Curriculum and to the testing regime. As these reforms have only recently been implemented, the benefits, or damage they cause will only become clear in the years to come. As a parent with children in the education system I will see personally what Gove (and his comic-book villain sidekick, Dominic Cummings) has done for the future of my family, aside from his (and Cummings’) leading role in Brexit. His subsequent stint at the Ministry of Justice was too short for him to have achieved anything, either way. Perhaps the same will be true at Defra. This Government is so inherently unstable that the likelihood of him staying at Nobel House for any length of time seems very small. If May falls (as seems increasingly likely later this year) Gove will have the opportunity for a promotion – or even another stab at the leadership. Depending on who gets in (eg a Remainer), he may also be consigned to the back benches again. While all these hypotheticals mill around, there are some things in his background which are worth bringing to your attention. Michael Gove is an unashamed ideologue. Unusually among the upper echelons of the Tory party he is a Neo Conservative or Neocon. By Neocon I mean someone who believes that not only should the State be shrunk as far as possible, Regulations should be removed to allow the free market to operate, but also that (American) military power should be used to impose this ideology elsewhere in the world. Notable Neocons of the past included Ronald Reagan and George Bush Senior and Junior, Margaret Thatcher and arguably Tony Blair. These days the other main senior Tory who espouses this doctrine is the disgraced former Defence Secretary, Liam Fox. It is therefore no surprise that Gove was on the council of Atlantic Bridge, a fake charity created by Fox to foster relations between British and American Neocons. Atlantic Bridge was closed down by the Charity Commission after the revelations of Werrittygate. Gove has been pushing the Neocon ideology for many years – here he is 2 days after 9/11, as a journalist for the Times, pushing for Iraq to be invaded. There never was a link between Saddam’s secular dictatorship and 9/11 – a recent lawsuit in the US seeks to show categorically that the attack was carried out by terrorists funded (indirectly) by Saudi Arabia. Gove has maintained his links with the American Neo-Conservative Right, via the extremely influential thinktank the American Enterprise Institute (AEI). The AEI was established by Richard Nixon’s vice president Gerald Ford. Key individuals associated with the AEI include Charles Murray, notoriously, author of The Bell Curve which sought to show causation between race and IQ. Gove has been in thrall of AEI-fostered thinking on Education; the AEI promotes Charter Schools (= Free Schools in the UK) and the idea of education vouchers, which parents can spend on state or private schools. Thankfully education vouchers have, so far, not been introduced here. One of the main funders of the AEI is the Devos foundation, Betsy Devos being the heiress to the Devos fortune, which was created from the Amway direct marketing scheme. Whether Amway is a pyramid selling scam or a legal multi-level marketing scheme is not for me to say. You’ll have to decide for yourself – there’s plenty of evidence. What is clear is that the Devos dynasty fund a lot of American Evangelical Christian Right movements and Devos is now Trump’s Education Secretary. The AEI is decidedly lukewarm when it comes to Climate Change – and regularly hosts blogs attacking Climate Change science, or action. The AEI is also strongly pro-deregulation and pro shrinking the state. If you think Gove is only marginally associated with the AEI think again. He spoke at the exclusive AEI global forum (held on a private island) in 2012, 2013, 2015 and 2017. He was on the guest list for 2016, but was replaced at the last minute by Sajid Javid. The AEI Global Forum is pretty secretive but there is some detail available publicly as to who attends (all the big US business owners) and who speaks. This form for a US Republican Politician attending in 2012 for a “discussion on tea party” (that’s the Tea Party) includes details about topics discussed and attendees. Gove spoke at this event, alongside David Davis, Liam Fox and Sajid Javid. 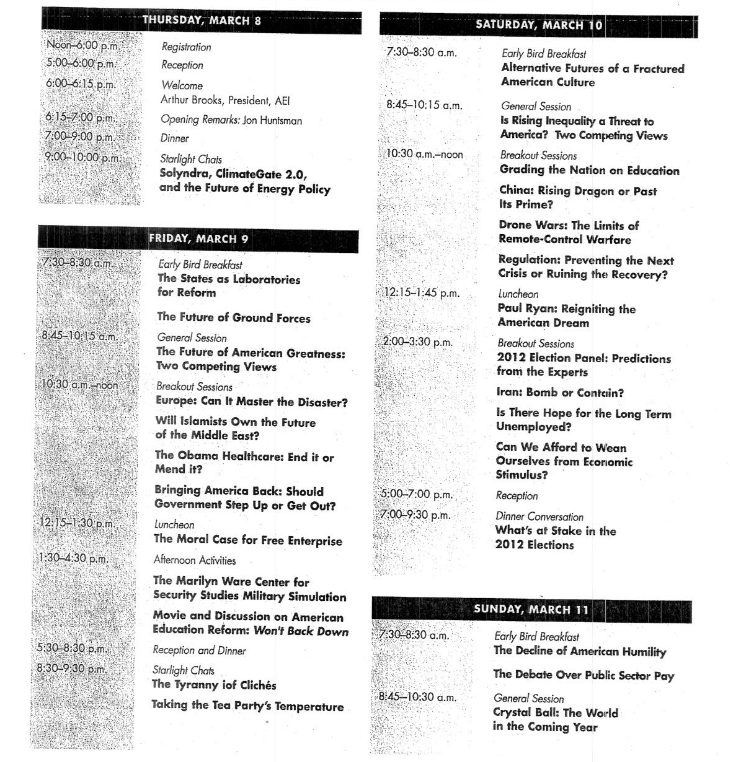 Here is the agenda for the 2016 AEI World Forum. I guess Gove was too busy with the Brexit campaign to go. You get the idea, though. Gove is no stranger to UK thinktanks either, having been the first chair of the Board for neoliberal thinktank Policy Exchange. Gove was chair at Policy Exchange for four years. It’s worth noting that Natural England chair Andrew Sells was Policy Exchange treasurer, though it would not appear that his and Gove’s time overlapped. Nevertheless they will no doubt know each other as senior movers and shakers within the Tory party and associated networks. Sells, for example, as well as establishing Linden Homes (which by coincidence builds houses in Gove’s constituency of Surrey Heath) was also Managing Director of Sovereign Capital for 10 years. Sovereign Capital was set up by two Tory party donors, and won lucrative contracts from the Coalition Government. One of the founders of Sovereign Capital, John Nash, was appointed to the Department for Education Board in 2010. Appointed by Michael Gove. What does all this suggest about Gove and his time at Defra? We know Gove is ideologically wedded to a deregulatory, small-state approach. So we can expect him to promote a reduction in regulatory protection for nature and the wider environment. Gove has already made his views known about the Habitat Regulations, as they affect housing. We can assume Gove will be keen to drop as many regulations emanating from Brussels as possible, during the passage of the Great Repeal Bill. On future agriculture policy, if he has any influence over the future direction of agriculture policy, it is likely to be closer to Owen Paterson’s view and the New Zealand model, of no or very little subsidy coupled with very little regulation. Gove’s friend from Atlantic Bridge days Liam Fox, for example, is also very keen on the New Zealand model. And, although Gove has now (for the moment) retracted his claims that Brexit will bring food prices down (thanks to the Brexit devaluation of the pound), he is still keen on lowering tariff barriers to food imports. And this is partly the problem with Gove and trying to work out what he will do. He appears to say whatever he thinks his audience wants him to say. If he’s talking to farmers, he’ll promise them subsidies and protection against cheap food imports. If he’s talking to “green Tories” he’ll tell them he’s a shy green and that Conservatism is Conservation. If he’s talking about nature in schools he’ll say he wants to put it at the heart of the curriculum. And if he invites himself to meet the RSPB (at one days’ notice?) he assures them he is in “listen and learn” mode. One might even consider Gove to be a pure political opportunist with no fixed ideology. But probe a little more deeply beyond this veneer and we can see that Gove does have a strong ideology – and it is being driven by his mentors on the other side of the Atlantic. Hopefully he will not be around at Defra long enough to do any real long term damage. This entry was posted in Andrew Sells, Defra, deregulation, farm subsidies, Michael Gove, neoconservatism, neoliberalism, Policy Exchange, Uncategorized and tagged American Enterprise Institute, Andrew Sells, Defra, Michael Gove, neoconservatives, neoliberals. Bookmark the permalink. yes, interesting. Any links between US side of Atlantic Bridge and American Enterprise Institute? It does not matter very much that Michael Gove mistakenly imagines that Boyle’s law is some kind of a fundamental principle. It matters a very great deal, however, that he saw fit to tell teachers that they should teach it as such. It is a sad reflection on the British educational system that Gove, an Oxford graduate, thinks that Newton wrote the laws of thermodynamics, thus showing unawareness of the difference between 17th-century mechanics and 19th-century molecular statistics; the difference between the age of sail and the age of steam. Again, that need not in itself mattered too much. What does matter at many levels is his wish to have “Newton’s laws of thermodynamics” incorporated into the physics curriculum. In both cases, the shameful ignorance displayed is not in itself the major problem. The real concern is Gove’s willingness to impose his ignorance. I have written on these topics before, most recently when he bid to become Prime Minister (“Why Michael Gove is not fit to lead anything”) but thought when that bid failed that I could let Gove lapse into the security that he so richly deserves. thanks Paul. I hadn’t spotted this particularly striking piece on ignorance from Gove, but little surprises me. That he can claim to have placed nature at the heart of the curriculum while having done the opposite is an indication of his attitude and his capacity for dissimulation.